Anthropologists often criticize mainstream media for exoticizing people. But in Borneo you’ll find indigenous people who promote themselves as headhunters and are proud of it. The journal Cultural Analysis has recently received a prize in the Savage Minds awards. It was voted as the second best Open Access anthropology journal. In the recent issue, folklorist Flory Ann Mansor Gingging writes about headhunting as an expression of indigenousness. 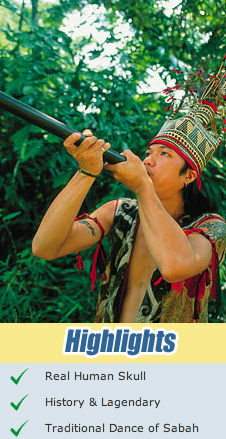 I propose that the tongue-in-cheek invocation of headhunting by the tourism industry represents one way in which Sabah’s indigenous people counter the outside world’s designation of them as the Other; that is, by parodying their headhunting past, they demonstrate their understanding of the joke and thus guard their indigenousness and their status as human beings. Marginalized groups in Sabah, many of whom share a headhunting past, have re- written the headhunting narrative in their favor, becoming co-authors of a cause that seeks, in Hoskins’ words, “to seize an emblem of power, to terrify one’s opponents, and to transfer life from one group to another” (Hoskins 1996a, 38). Thus re-imagined, the headhunting narrative emerges as a tool useful in working towards change and equality. Observed in cadence with past and present political milieus, the “refashioning” of the headhunting narrative within tourism in Sabah hence seems to reflect a general consensus among certain of Sabah’s native groups: that Otherness, strategically invoked and appropriated, provides them with an instrument for addressing external threats to their identities. As I got older, I began to be aware of the economic and political struggles that indigenous people in my state face. Since becoming part of Malaysia in 1963, Sabah, a former British colony, had never had a chief minister who was both indigenous and non-Muslim. Consequently, when in 1984, Joseph Pairin Kitingan, a Dusun lawyer, became the first non-Muslim native to assume this position, being indigenous suddenly meant something to me. It was also around the same time that I remember feeling a new attraction to the macabre and exotic elements of my culture—one of them being headhunting. Without quite knowing it, I was invoking those aspects of my culture that were potentially embarrassing as a way of responding to the threat I felt towards my own Dusun-ness. For me, headhunting ceased being just a part of history and became, in the most personal way, a part of my heritage—an expression of my indigenousness. In my opinion, making headhunting such a visible icon of tourism in Sabah is an example of what Michael Herzfeld calls “cultural intimacy,” which he describes as “the recognition of those aspects of a cultural identity that are considered as a source of external embarrassment but that nevertheless provide insiders with the assurance of common sociality” (Herzfeld 1997, 3). A good example for this trend is the Monsopiad Cultural Village. Here, she writes, Herzfeld’s “cultural intimacy is performed". Although it is by no means the first to use the state’s headhunting histories within the context of tourism, she believes the Village is the only tourist site that has developed an entire park around the headhunting theme. Monsopiad Cultural Village, the traditional village is a historical site in the heartland of the Kadazandusun people and it is the only cultural village in Sabah built to commemorates the life and time of the legendary Kadazan and head-hunter warrior: Monsopiad. The direct descendants of Monsopiad, his 6th and 7th generations have built the village on the very land where Monsopiad lived and roamed some three centuries ago to remember their forefather, and to give you an extraordinary insight into their ancient and rich culture. Have they forgotten to password protect the papers? Last year, you needed a password to open the papers of the ASA conference Anthropology and Cosmopolitaism. This year's papers are freely accessible to everybody- good news! A step towards Open Access Anthropology? 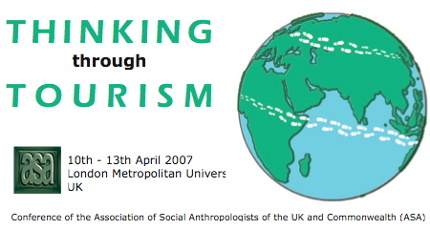 Thinking through tourism was the topic of the annual conference by the Association of Social Anthropologist of the UK and Commonwealth (ASA). The papers can be found in the sections Panels and Plenaries. How do low-cost airlines influence how people and money travel? Andrzej Majewski, a Pole who works as a thoracic surgeon in Britain, catches a ride to the airport in Wroclaw on Sundays and hops a Ryanair flight to his hospital in Nottingham, England. Most Fridays he commutes home to southwest Poland. The flights cost him about $50 each way. "It takes about three hours, and I'm eating lunch at my house," Majewski said. "The low-cost airlines really facilitate a type of hypermobility for the public at large to do anything from leisure to business, to new careers", Steven Vertovec, a professor of transnational anthropology at Oxford University comments. But not everyone is happy with Europeans' mobility. People in countries served by budget airlines complain that British bachelor and bachelorette parties are taking over Eastern European cities like Riga. "I know about guys who go to Prague for a weekend of cheap beer, prostitutes and fighting. "People there really complain about it — and that's due to low-cost airline", Vertovec says. Vertovec is director of the Oxford Center on Migration Policy and Society. The center has published lots of working papers online. I've written about one of them before “No Pizza without Migrants”: Between the Politics of Identity and Transnationalism by Susanne Wessendorf. The Botswana government has encouraged the local inhabitants of the Central Kalahari Game Reserve to resettle, as the San has been accused of poaching, and it is claimed that the tourists who come to Central Kalahari wish to see unspoiled wilderness. (...) As the San are being removed from the reserve, and more tourists are brought in, the area’s attraction as a reserve seems to have only to do with its value as a resource for tourism. Prejudice, discrimination and racism still stand in the way for development in Botswana. In the space of a few years, Botswana has been transformed into one of Africa’s richest countries, with an economic growth that has prompted a massive social change. In wealthy Botswana, hunting and gathering are clear indicators of poverty. The solution to this poverty is believed to be assimilation into the dominant Botswana society. Having the apartheid regime of neighbouring South Africa in thought, at independence the Botswana regime decided to ignore any cultural differences among its people. Black or white, cattle-owner or huntergatherer, everybody was to be treated as if they were the same. Consequently, poverty, not discrimination, was seen to be the main problem of the San. The relocation-program has thus a lot to do with the governments attempt to assimilate a people they regard as being “backward”. (via Savage Minds) All but a few of the Bushmen living in Botswana's Central Kalahari Game Reserve have been forcibly removed from their homes in recent days in what spokesmen for the affected communities said is a final push by the government to end human habitation there after tens of thousands of years, according to Washington Post. Their increasingly sedentary lifestyle -- which includes keeping domestic animals and using motorized vehicles -- makes them incompatible with a park for wild animals, Goverment officials say. The Kalahari reserve is a major tourist attraction for the southern African nation of 1.6 million. According to Molapo's chief, Molathwe Mokalaka, officials told the villagers that if they stayed, "you will eat the soil. Nothing else but the soil." Villagers here said they never would have left Molapo if not for the guns and threats of police and wildlife officers. Some critics also contend that the government's motive in removing the Bushmen is to gain easier access to deposits of diamonds located in the game reserve. Molapo is now just a ghost town of empty huts made of sticks and grass. It was one of the last traditional communities of the hunter-gatherers who once roamed most of southern Africa. My doctoral research looks at the way in which tourism is changing and interacting with the performance and meaning of traditional Irish music. I carried out over 14 months of fieldwork in a small, rural Irish village of under 600 people, called Doolin, in northwest County Clare. Anthropologists and sociologists are relatively new to the field of tourism, but I would argue we have some powerful qualitative tools at our disposal that can contribute to a much richer understanding of tourists and tourist destinations. This is true not just for tourist populations, but for other mobile or shifting groups like asylum seekers or economic migrants.